Mr Speaker, I would like to take this opportunity to inform the House on my defence responsibilities in light of considerable media coverage and on the interim report this morning by the Permanent Secretary. I would like to discuss the meeting in Dubai in June 2011, my relationship with Mr Werritty, and my involvement in Sri Lanka. I’ll take these in turn. As I said yesterday, I accept that it was a mistake to allow distinctions to be blurred between my professional responsibilities and my personal loyalties to a friend. Mr Speaker, I am sorry for this. I have apologised to the Prime Minister, to the public, and, at the first opportunity available, to the House. Let me deal first with the Dubai meeting which has been the subject of so much speculation. Mr Werritty first met Mr Boulter of Cellcrypt on 1 April 2011 in Dubai. This meeting was arranged by the lobbying firm Tetra. At this time Mr Boulter asked for a meeting to discuss Cellcrypt. Nothing happened for three months, but during the week of 13 June Mr Werritty was dining in Dubai and Mr Boulter again requested a meeting, and Mr Werritty suggested that it might be possible the following day as I was coming through on my return from visiting forces in Afghanistan. The meeting took place on the morning of 17 June where there was a general discussion about Cellcrypt and what it might be able to do to support the MOD. At the end of the meeting, in the interests of probity, Mr Boulter mentioned that he was in a dispute with 3M alongside the MOD, and I acknowledged this. Beyond this there was no discussion of the case or any individuals involved, nor was any classified information discussed. That night Mr Boulter sent e-mails claiming that he had had discussions on the issue of George Buckley’s knighthood. This correspondence later became the basis of a blackmail case in the United States. I made it clear that I was willing to testify that I had never had any such discussions. Subsequently, Porton Group has since clarified that Harvey Boulter did not in fact discuss the matter of the knighthood. I accept that I should not have had a meeting with the potential commercial supplier without an official being present. This was entirely my fault and I take full responsibility for it. After the meeting however I notified my private office and asked them to prepare a brief on the subject of Cellcrypt. Let me turn now to Mr Werritty, who I first met in 1998. While in opposition he worked as a paid intern in my House of Commons office and at this time he had a parliamentary pass. He also received payments for research work undertaken during my time in opposition. Records currently show total payment of some £5,800 over the total period. He has not received any payment from me while in government. He has a very wide range of long-standing business, international relations and political links of his own. He did not receive any payment as a result of the meeting in Dubai nor has he been involved in any defence procurement issues. As a matter of transparency I would like to inform the House that I have met Mr Werritty in the margins of 18 trips of various sorts overseas, including annual leave family holidays with family and friends on a total of 18 occasions. As the Permanent Secretary points out in her report today, Mr Werritty visited me at the Ministry of Defence over 16 months either in my office or in the refreshment facilities on 22 occasions. The majority of these were short social meetings. In only four instances were others present. Three related to Sri Lanka and one was with Martin Gould known socially to both. It was also during one of these meetings in June that I first learned about, and told him to stop using, his business card stating he was my adviser. Mr Werritty was never present at regular departmental meetings. During private meetings we did not discuss either commercial or defence matters. He had no access to classified documents nor was he briefed on classified matters. As I said yesterday, I accept with the benefit of hindsight that I should have taken great care to ensure a more transparent separation of government, party political and private business and that meetings were properly recorded to protect myself and the government from any suggestion of wrongdoing. Again, I accept my personal responsibility for this. The Permanent Secretary is making arrangements to ensure that such a separation of powers in the future will exist. In addition, because I do not believe that to be enough, Mr Werritty will not make private visits to the MOD in future, will not attend international conferences where I’m present, and will not meet socially abroad where I am on official business. This should ensure that no appearance of potential wrongdoing will occur in the future. On the issue of Sri Lanka, since 1996, when I was a Foreign Office Minister, I have been involved in attempts to help resolve the conflict in Sri Lanka. As the war with the Tamil Tigers drew to a close I worked with a number of others in business, banking and politics. It was my aim to create a mechanism that would allow reconstruction funding to occur through the private sector. This was called the Sri Lankan Development Trust which seeks to promote post-conflict reconciliation and development in Sri Lanka. The aim was to use a proportion of profits made to fund development projects in Tamil communities. Neither myself, Mr Werritty, nor others, sought to receive any share of the profits for assisting the Trust. During the Shangri-La Dialogue of the International Institute for Strategic Studies in 2010, I attended a bilateral meeting with the Sri Lankan Foreign Minister. This was attended by Mr Werritty, MOD officials and was minuted. The purpose of the meeting was to make clear that, while I would no longer be able to participate in the project, that others involved would continue to do so. In December 2010, Mr Werritty and I met with the Sri Lankan President in London. This was not an official visit - whence why it was held in the Dorchester Hotel. In July 2011 I gave a lecture hosted by Mrs Kadirgamar, the widow of my friend and Tamil former Foreign Minister Lakshman Kadirgamar who was assassinated, as the House will know, by the LTTE [Tamil Tigers] in 2005. Mr Werritty, who is a personal friend of Mrs Kadirgamar, helped with the arrangements as it was a personal not a ministerial commitment. I know there are some in the Sri Lankan Diaspora who do not want any contact with the current government but, as I said in my lecture, unless we have reconciliation based on mutual tolerance and respect for all citizens, regardless of ethnic origin, we will not find peace in that island. Mr Speaker, I have made it clear throughout this process that my desire is to be as transparent as possible and I accept where I have been at fault, as ministers must be. Following these interim findings the Prime Minister has asked the Cabinet Secretary to work with the Permanent Secretary to complete the report addressing all the remaining questions that have been raised publically and privately by this issue. And I will fully and willingly co-operate with this. 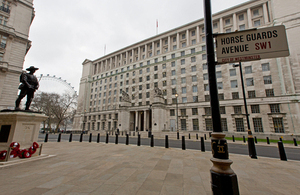 See the letter to Cabinet Secretary Sir Gus O’Donnell setting out the interim findings of the Ministry of Defence Permanent Secretary Ursula Brennan’s inquiry into the Defence Secretary’s meetings with Adam Werritty at Related Links.